Recently, one of the last potteries from the Old Edgefield District has found itself in the way of progress. Baynham’s pottery was relocated in the late 1800’s to this location from Trenton, SC. They managed to keep production of utilitarian pottery into the 1930’s. This site was the location for brickmaking, as well as garden-type earthenware production. The site is presently being cleared for a storm water retention pond. The many sherds left scattered about the site show that Albany slip was the preferred glaze treatment. Jug handles were joined at and onto the necks. 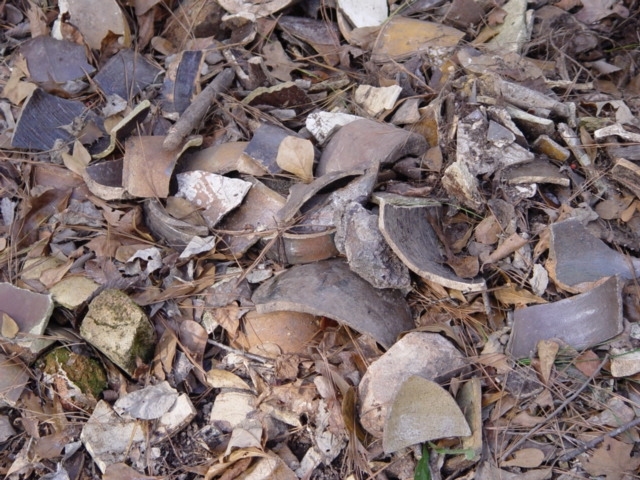 There was a small number of sherds that appeared to have a Bristol or whitish-gray glaze. The pottery site has the remains of at least 2 groundhog kilns visible and several waster piles. 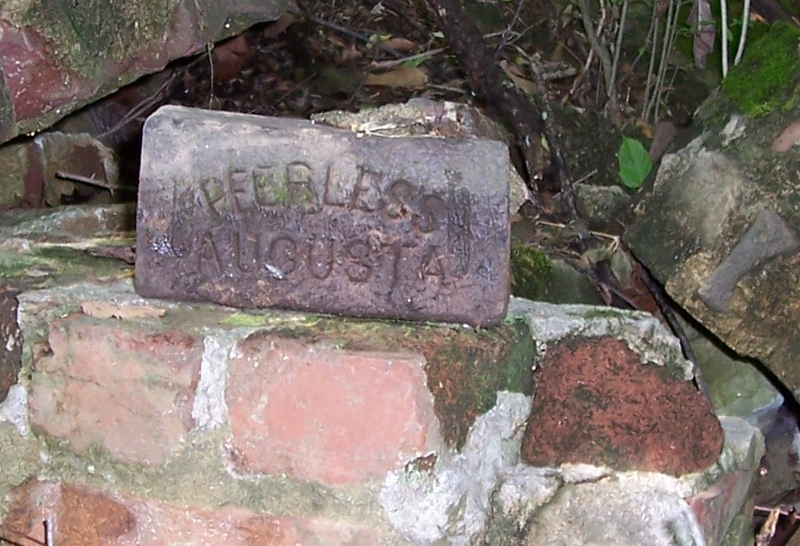 Many of the remaining foundations of structures on the site were made from brick with the markings, “PEERLESS/AUGUSTA. The large number of unmortared single bricks scattered about the site may indicate these were made here. The pottery sat on top of a vein of blue-colored clay. This clay was layed down when an ancient sea covered this area and is a kaolinite high in alumina, which is great for stoneware pottery. While this clay by itself is somewhat short or non-plastic, it performs beautifully when blended with the buff stoneware clay veins that alternate with the blue clay at the site. We have managed to procure a sizeable quantity of the clays from the site. 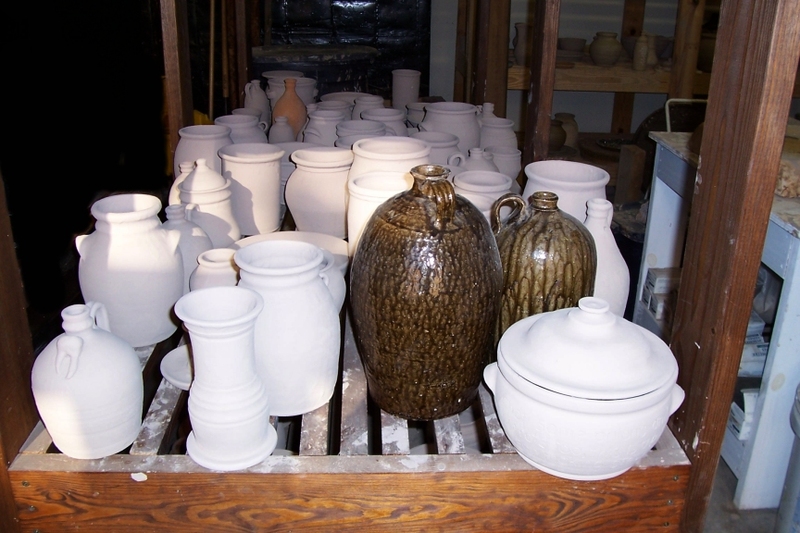 Though Baynham’s pottery site will cease to be, collectors of their pottery can take heart as Old Canal Pottery continues the tradition of southern alkaline-glazed, wood-fired stoneware pottery using clays from the old site. 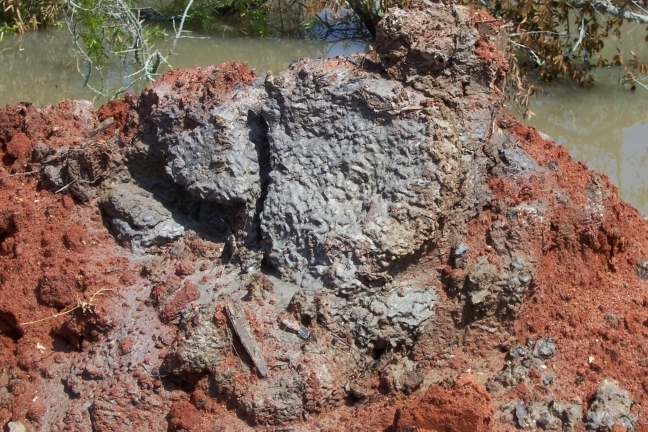 The clays fire to a light gray color. Our kiln is filled and the wood is cut and stacked. We will be firing our latest work soon! Slaghammer, talk about the stink that comes with good free clay! Wow! My studio smells like 30 dirty diapers are stashed in it all of the time. I’ve read that adding a few drops of clorox lessens or alleviates this, however, I’m hesitant to kill any of those sweet microbes that make the clay workable. My clays are lacking in some properties. 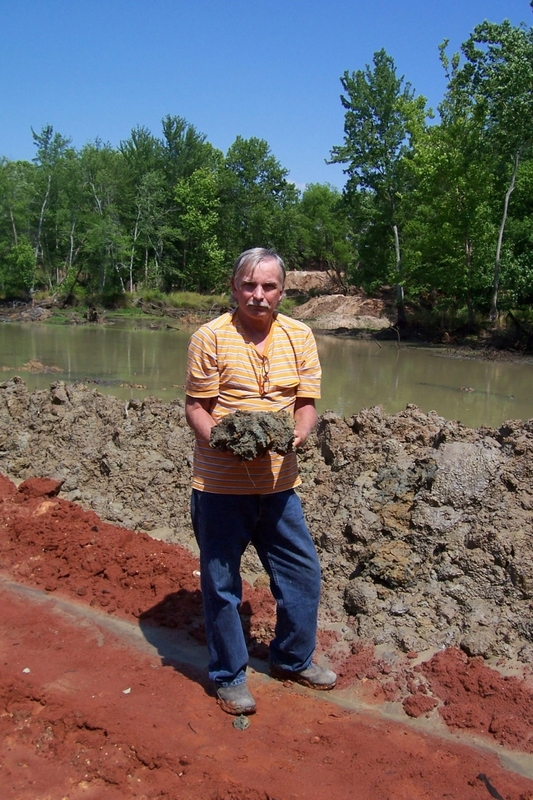 Most of the clays around here are high in kaolin content and are somewhat short or non-plastic. Those stinking microbes seem to help with plasticity in some way. Now get this: I’m actually starting to like that horrible smell and have given up the idea of turning pots with a gas mask strapped on!I’m still experimenting, Slag, and am thrilled to hear you’ve started! Modern potters have become such a whining lot. I never cease to hear complaints about clay when conversing with other potters. That’s probably because the crap they’re using barely resembles real clay because it’s so super-fortified with other minerals and then reconstituted from a dry powder. These native clays I use have not dried out for eons or at least a few epochs. I mix or blunge them into a slurry, strain out the roots and larger rock with a 35 mesh strainer, then spread it out to dry to the moisture content I want. Commercial clays are always too dry for my liking. The remaining flint and granite grog help hold it up with the increased moisture, though it does shrink quite a bit while drying and firing.The bags of commercial clay purchased vary in moisture content from inside out. They also seem to have a hard layer on the outside where clay particles are tortured during extrusion in the pugmill. Essentially, they need to be heavily processed by wedging or re-pugging before using, even though you pay around 50 cents a pound for it, not including expensive shipping as you are well aware of.I am thrilled to scoop up the Earth as I find it and pull up a pot. Yes, occasionally I have to pick out a rock as I turn the pot on the wheel, or a root. I’ve even had deer hair mixed in. This is what potters for ages have done and they made some pretty fine stuff. And the clay is FREE! That’s the best part! I think potters gain in all ways when they gather their own clays. I, too, walk around with hands stained red by Earth and clothes ruined with red blotches. My truck has perpetual piles of Earth inside and out. My shoes stay spattered with clay. It seems to suit me. Good luck Slaghammer, keep me posted on your experiments and thanks for the comment! Where I live there’s red clay everywhere. Can any of it be used for pottery? If not, how do I tell if it’s pure enough clay to be useful? I’ve been thinking there’s some special vein of clay I need to find, but it sounds like you all are saying that it’s pretty much everywhere. I was told that it’s clay if it feels slippery when you make a slip of it (duh). I tried soaking some I thought was clay, but there were lots of hard grains in it, but I had not screened it. Is that what I’m missing here?